THURSDAY, Oct. 30 (Health.com) — November is diabetes awareness month, and a new report suggests that a record number of people are personally aware of the disease—in fact, they have it. There has been a 90% increase in the rate of new diabetes cases diagnosed in the United States in the last 10 years, according to the Centers for Disease Control and Prevention (CDC). An analysis of 33 states showed that new diabetes cases increased from 4.8 per 1,000 people in 1995–1997 to 9.1 per 1,000 in 2005–2007. The CDC did not have enough data from the other states to make comparisons for the two time periods. “This dramatic increase in the number of people with diabetes highlights the increasing burden of diabetes across the country,” lead author Karen Kirtland, PhD, a data analyst with the CDC’s Division of Diabetes Translation, said in a statement. 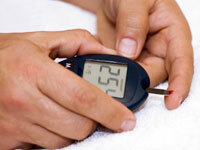 Earlier this year, the CDC cranked up its estimate of the number of diabetics in America. There are now about 24 million people with diabetes in the United States, and 57 million with prediabetes, a condition in which people have elevated blood sugar that's not high enough to be classified as full-blown diabetes. The rate of new cases was highest in the South, with states like Alabama, Florida, Georgia, Kentucky, Louisiana, South Carolina, Tennessee, Texas, and West Virginia leading the way. Minnesota had the lowest rate of new cases at 5 per 1,000; West Virginia was highest at 12.7 cases per 1,000. The states with the highest rate of new diabetes cases also have some of the highest rates of obesity, a contributing factor to type 2 diabetes. According to another study, which was released in July by the CDC, Alabama, Mississippi, and Tennessee have obesity rates that exceed 30%.